Our baby girl, Isobel's modern baby kitten nursery theme features an eclectic blend of contemporary, traditional and vintage decorations. The clean lines of the contemporary crib and the elegant drape of the wall banner proudly displaying our daughter's name provides a pleasing visual contrast in decorating styles. And the contrasts don’t end there. The unique qualities include three very hip, very mod kitty cats that are positioned to keep watch over the baby’s changing area and to keep an eye on the two birds that were given the task of holding the banner with the baby’s name on it aloft over the baby’s bed? Or could it be that the kittens on the nursery wall are simply waiting for just the right moment to pounce on the colorful fabric butterflies on the baby mobile that bob in the breeze just enough to make them an object of interest? There is at least one cat somewhere in the nursery at all times it seems. It is natural that the decorations that we chose for our baby girl's kitten nursery design will be entertaining to both kittens and newborns. As you can see, I love to use my imagination and make up whimsical little stories based on my surroundings. 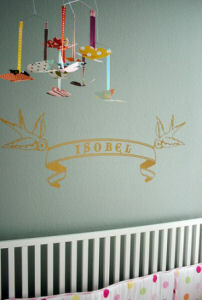 The dancing butterflies featured in a wide array of colorful papers are sure to catch the eye of baby and kitty. 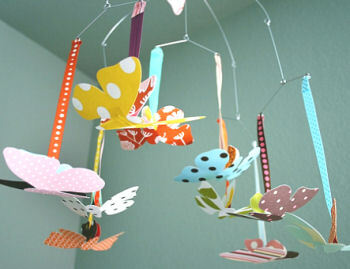 Pay close attention to safety when making your own mobile for the nursery or opt for a ceiling mobile. 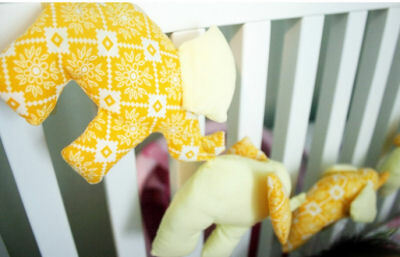 Stuffed elephants on parade are featured in this handmade bunting. The modern baby kitten nursery theme may be designed for the impending arrival of Princess Isobel but there is a gentleman already in residence that seems to be very appreciative of the cat baby nursery theme. Peaches, the resident tomcat, has given the baby’s room his stamp of approval by having made the mint green cushion on the changing table a destination for a catnap. So, now the baby's kitten room design is complete and I couldn't be happier with it. It took a lot of work to put it together, but fortunately not a lot of money. The only expensive item in the room is the crib. And I'm relatively certain that if I was a more patient person I could have found one second hand. 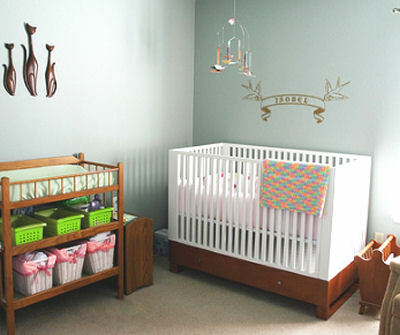 However, I would not have changed the style as the crib is perfect for the mix of modern and vintage decor. I’m very happy to say that Isobel’s nursery is easily my favorite room in the house and that the cats of the house approve as well. Thanks for sharing Isobel's room with Unique Baby Gear Ideas and I'm sure that princess Isobel is positively delighted with her lovely room. See more photos of this cute, kitten nursery HERE! 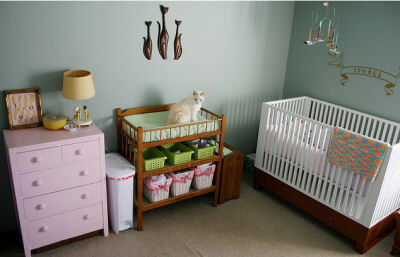 I am planning a nursery with kitty cat decorations for my daughter. I was pleased to find your pictures as the only photos I had found were in the Hello Kitty theme. Eclectic and I like it!